The paper presents TOFD, the Time of Flight Diffraction Technique, currently the most promising ultrasonic technique for examination of heavy wall thickness welds on Pressure Vessels TOFD, is a computerized ultrasonic system, able to scan, store, and evaluate indications in terms of height (through thickness weld), length, position, with a degree of accuracy never achieved with other ultrasonic techniques. A record of examined sections is available in unprocessed form on floppy disk or CD and readable in Word for Windows 95. The ASME Code, with Code Case no. 2235 has accepted this method in lieu of radiography examination for thicknesses over 4 " (1). Experiences on 75 mm up to 300 mm thick welds of 2.5 / 3 % Q 1 Mo, 0.25 V and Carbon steel are discussed. The technique has been applied on longitudinal, circumferential and nozzle-shell/bead welds. Scanning Plan Data and its validation are reported with used test blocks. Cladded layers in TOFD images are presented. Based on experience to date, prospects for this new technique are of great interest. 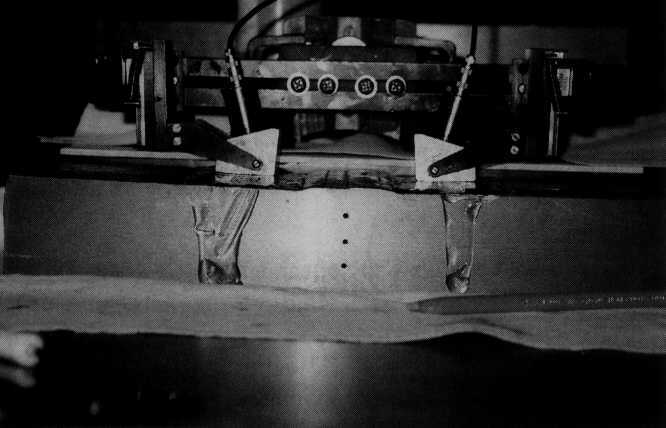 The TOFD technique was first applied in 1985 at the Harwell Center (UK) in response to insistent requests to size cracks in nuclear reactor welds (2). The TOFD technique is a fully computerized system able to scan, store, and evaluate indications in terms of height, length, and position with a grade of accuracy never achieved by other ultrasonic techniques. The TOFD technique is based on diffraction of ultrasonic waves on tips of discontinuities, instead of geometrical reflection on the interface of the discontinuities. This phenomena makes TOFD ideal for identifying cracks, lack of fusion located along the vertical axis of the weld (in particular for narrow gap preparation) or with any other orientations, because detection is not affected by the negative consequence of ultrasonic beam deviation from the receiver due to unfavourable orientation of the discontinuity. These features have extended the use of TOFD to replace Radiography and complex Ultrasonic inspection by tandem technique wherever planar defects (cracks, lack of fusion) are the main object of examination. The main disadvantages to both the aforementioned techniques are expensive manipulation for Radiography on big parts and the amount of time required to perform the tandem technique due to the accuracy necessary for reliable testing. TOFD overcomes both techniques in terms of speed of examination and higher accuracy. Experience acquired in application of TOFD has fully demonstrated its reliability and detection capacity with respect to other methods (3). This has induced potential users to establish procedures for coding TOFD in recognized standardized norms. ASME Code has included in Section V, art. 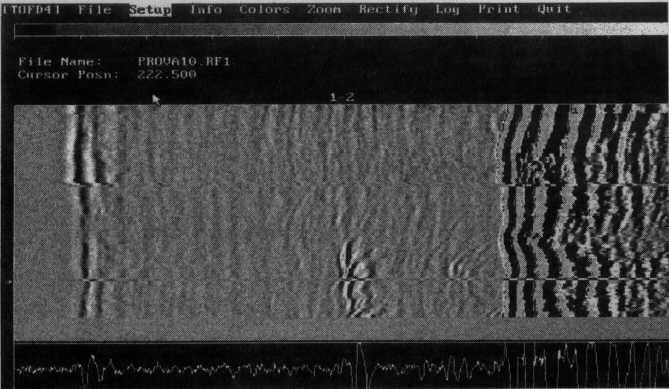 4, Appendix E, the computerized ultrasonic system and TOFD technique for ultrasonic examination of welds (5). An "ad hoc" Workgroup has been nominated from within the ASME Technical Committee to prepare a document establishing the conditions for using computerized systems, such as TOFD in replacing Radiography examinations of welds, in the over 4" thickness range (see Code Case). CEN (comite Europeen de Normalisation) has issued the document CEN/138/WG on practical application of TOFD for ultrasonic examination of welds (6). One of the major applications of TOFD is the ultrasonic examination of welds after final heat treatment and/or hydraulic testing, to verify the absence of cracks not detectable by Radiography and to prove conformity with prior ultrasonic manual examination carried out during construction. In addition to higher sensitivity, the TOFD technique allows the full examination data to be recorded on hard disk, displaying all discontinuities in C/scan images. This enables "off line" evaluation of indications by computer using dedicated software. Very accurate sizing of defects can be achieved and printed for documentation. Another advantage and current application of TOFD is its use in monitoring welds during the service life of components. Stored data acquired from initial examinations, made during the final stage of construction, can be compared with new data obtained from in-service inspection. This allows the stability of existing indications to be determined with high accuracy and reliability. The more accuracy guaranteed by TOFD in sizing thruwall extention of flaws allows more reliable fracture mechanic calculation for the residual life evaluation. Companies like Exxon, Shell, Fluor Daniel, Texaco, Chevron etc. are using TOFD to replace radiography in examination of welds after PVMT or hydraulic testing. The main inspection agencies have approved procedures of the TOFD Technique and its validation. Fig. 3: TOFD map of the calibration on ASME test block of 185 mm (7.28 inch) with three holes of 7.5 nun (1/3 inch.) diameter. The TOFD map shows the three holes with symmetrical mode conversion indication. The straight lines at left and right of the TOFD map are respectively the later wave (scanning surface) and the back-wall waves (opposite surface). The space between these two line represents the thickness of the weld. 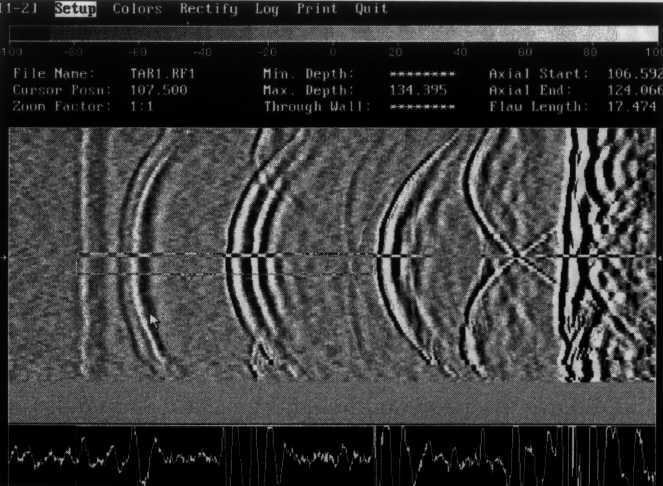 In Figure 1 TOFD waves pattern and the corresponding A-SCAN image are represented. The Figure 2 shows how spherical waves are generated on the tips of the cracks when incident longitudinal waves cross the tip. The Figure 3 shows a typical TOFD image obtained during calibration of equipment on two cylindrical holes. The Figure 4 represents the mathematical and geometrical model on which TOFD software is based. measure the trough thickness dimension in TOFD Technique. Fig 5: Block diagram of TOFD ultrasonic computerized system. Fig 5a: The TOFD system in its practical aspect. Probes need special characteristics to emit short pulses to improve accuracy m Time Of Flight measurement. In case of small thicknesses high frequency can be used, 4-8 MHz. Portable computer , Pentium , with minimum 3 slot free for installed the boards, color screen active matrix TFT, Window's 95. All the mentioned parameters, after validation, are reported in the relevant SCANNING PLAN, see an example on Figure 6. Fig. 6 - Scan Plan indicating the main parameters value to use in relation of the thickness examined. Fig 7a: - Scanning direction - parallel to the weld axis. Fig: 7b - Scanning direction - perpendicular to the weld axis to improve sizing accuracy of indication. The scanning directions for examination of welded joint has carried out moving the holder parallel to the weld axis, see Figure 7a. In case of flaws, in order to better characterize the shape and its dimension an additional scanning perpendicular to the weld axis shall be performed (Figure 7b). 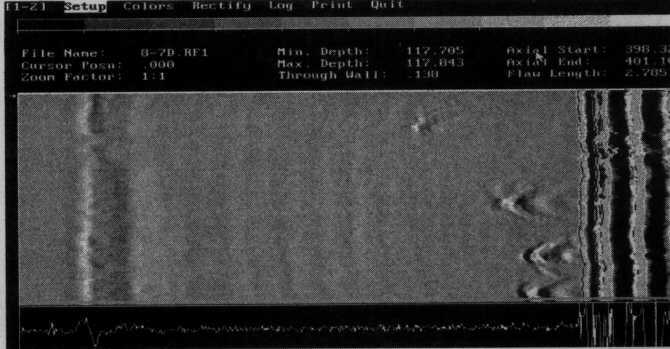 Fig 8: B-Scan image in real time create and visualize on PC during the scanning of 1 meter length weld and 135 mm (5.3 inch.) of thickness. All data of examination are collected in real time by the system. 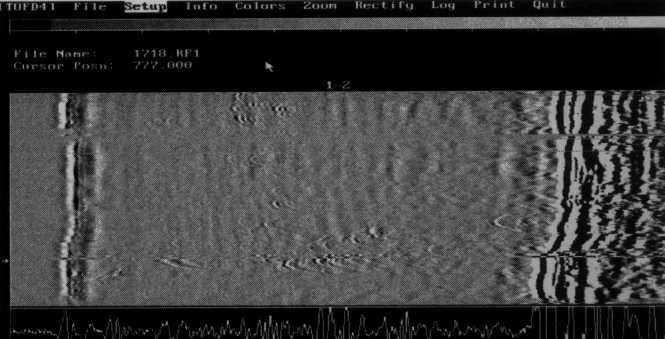 The image that appears on the monitor is represented in Figure 8. Backwall and lateral waves have to appear permanently on the screen; this is a proof that good contact and correct amplification have been applied and maintained during the inspection. All data are recorded into the computer and can be transferred in standard floppy. When indications are detected the software can easily show the TOFD image as indicated in Figure 9 on which any kind of evaluation and sizing can be done. Fig. 9 - TOFD image, visualize in post processing software (TOFD) for evaluation data and sizing indications. Fig 10: Lack of fusion not detected by radiography test and clearly displayed on the TOFD map. Thickness of weld 120 mm (4.7 inc.). Fig 14: TOFD map of a cladded test block of 170 mm (6.7 inch) thickness with overlay weld. The TOFD map shows on the left a strong lateral waves, through the thickness the three holes and before the backwall an "interference" image like a transparency which represents the cladded layer. Experiences are referred to a number of high thickness reactors (Cr, Mo, V steel) representative of the current production of NUOVO PIGNONE Massa shop. 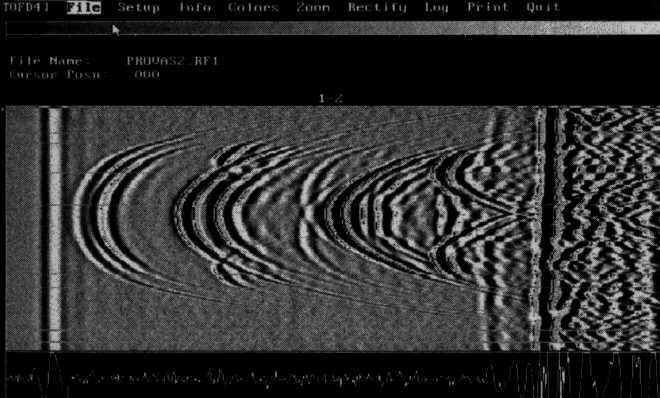 Ultrasonic pulse echo according to ASME sect. VIII. Radiographic according to ASME sect. VIII. Tests have been performed during construction, after post weld heat treatment and after hydraulic test. 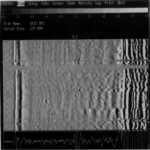 The TOFD technique has detected all the indications which have been revealed by radiographic examination and traditional ultrasonic testing (pulse echo). The results referred to the single techniques are the following. All indications visible on RT are visible on TOFD image. Some flaws with planar characteristics as lack of fusion, not detectable by RT have been clearly displayed on the TOFD image giving evidence of type of defect (see Figure 10). All indications visible with pulse-echo have been displayed on TOFD image. 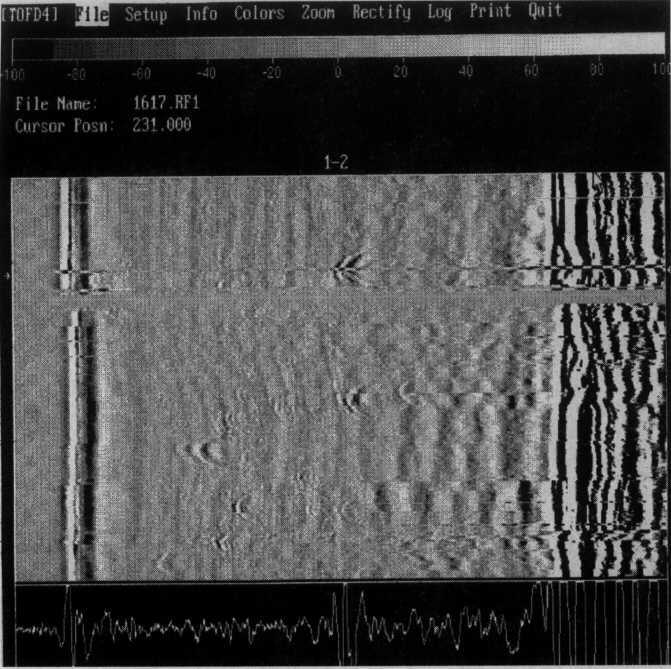 Some minor flaws, that are not detected or interactive with the noise using pulse echo in standard ASME calibration, have been clearly shown on the TOFD image (see Figure 11). Some other images of TOFD examination are shown in figures 12 and 13. During the examination of cladded reactors we have been surprised about the good visibility on the TOFD images of the cladded layer (see Figure 14). This is a really new possibility to examine and measure the thickness and discover cracks or disbonding flaws (1). 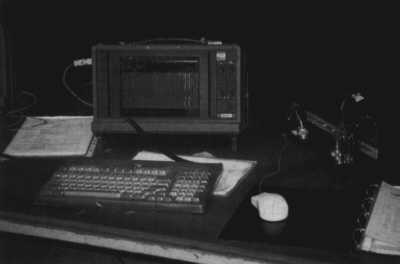 Fig 15: Scanner on test block for calibration before scanning. Fig 16: Picture on PC monitor showing the three ASME block holes. The experience so far has demonstrated that the TOFD technique is a new powerful tool to improve results of NDE examination of welds. 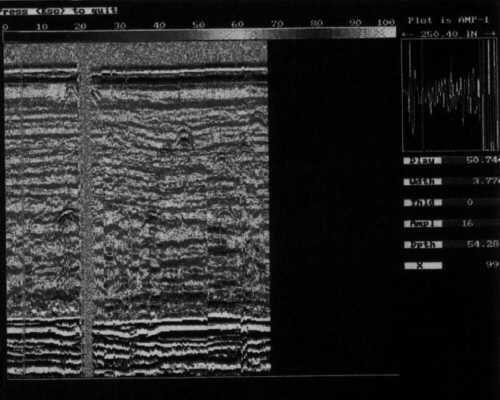 TOFD technique is able to detect defects which are normally visible either by radiographic examination or traditional ultrasonic testing (pulse echo). Images obtained by TOFD guarantee that the examination is reliable and complete in terms of coverage of the zone to be inspected. They also illustrate the overall quality of welds in a compact and rational form. Reviewing the moltitude of TOFD images and comparing with A-scan presentation from pulse echo it appears with great evidence the richness of TOFD images. The number of information obtainable simultaneously observing a TOFD image give us an image of the flaws close to the reality. This give to Ultrasonic examination the powerful of image. This is an exceptional aid to familiarization with NDE for production workers not specialised on NDE techniques. It can be applied with reasonable investment during construction and in service giving good compromise between profit and quality results.